Rising Waters Create Rising Fears. Let Us Help You Today. Many homeowners are unaware that their policy may not cover flooding. Unfortunately, in most cases, flooding isn’t covered in a homeowner's policy, so you can see why flood insurance is an important thing to have when the unthinkable happens to your home. 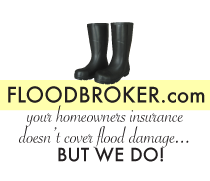 Bentley DeNight Insurance makes sure you are protected with quality Florida flood insurance. Beyond rising waters, flood insurance covers damage caused by rain, melting snow during thaws, storm surges, and mudflows. We want to make sure that the coverage you already have is worth the cost. Whether you live in St. Petersburg or Seminole, FL, let us review your liabilities and existing coverage to determine this cost. Communities participating in the National Flood Insurance Program (NFIP) may offer federally-sponsored flood insurance coverage through the Federal Emergency Management Agency (FEMA). Our experienced agents are waiting for your call to answer your questions. Contact us today at (727) 344-4500.